A broken heel bone is called a calcaneal fracture. 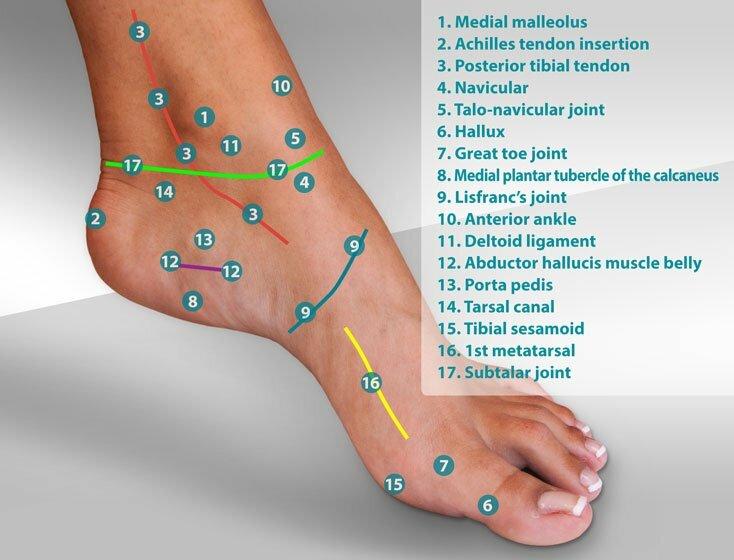 There are many types of calcaneal fractures that are described by several calcaneal fracture classifications schemes. Treatment of a calcaneal fracture depends upon the location and severity of the fracture. Calcaneal fractures can be difficult to treat and have a history unpredictable outcomes. Fractures of the calcaneus often result in collapse of the normal height of the heel bone. Disability associated with calcaneal fractures is significant, often resulting in permanent disability. 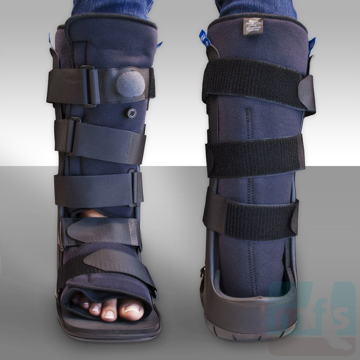 A stress fracture is a nondisplaced defect in a bone that occurs due to repetitive load or trauma. A calcaneal stress fracture is most often the result of a sudden, abrupt injury but can occur without a history of trauma. The diagnosis of calcaneal stress fractures can be difficult at times. The appearance of a stress fracture on x-ray is not always evident. Quite often, the only x-ray findings seen are those signs that show up towards the end of the healing process, sometimes as long as several months after the onset of the injury. The initial fracture may not be visualized, but the healing bone will show evidence of a fracture 4-6 weeks after the onset of the injury. If the initial clinical findings of heel pain seem suggestive of a stress fracture, there are several tests that can be used to help determine the diagnosis. These tools include plain x-ray, bone scans, CT scanning, and MRI. Plain x-rays may be used to diagnose a calcaneal stress fracture, but often, with lack of disruption of the bone, plain films lack the ability to identify the fracture. As fractures heal, many times the healing process can be seen on plain x-ray films. The healing process will increase the amount of calcium surrounding the fracture. This increase in calcium is called bone callus. The formation of bone callus takes 4-6 weeks to see on plain x-ray, therefore, periodic follow-up x-rays may aid in diagnosing a stress fracture of the heel. 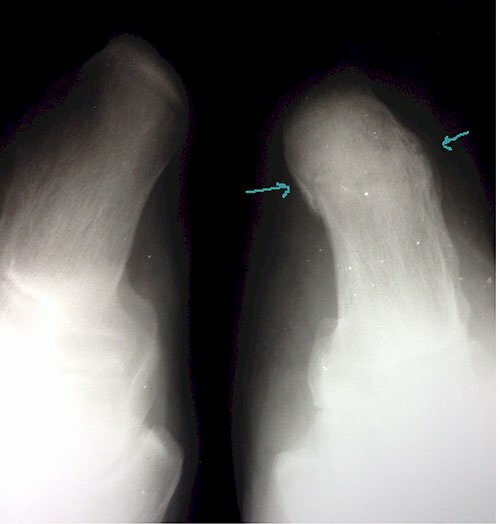 Additional findings of a stress fracture may include radiolucency (darkening) of the x-ray in the early stages of fracture repair. 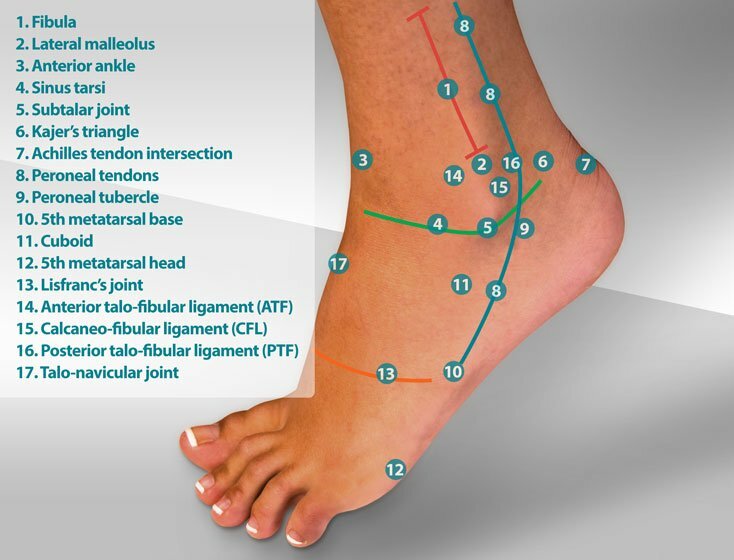 A three-phase technetium bone scan can help differentiate the location and degree of inflammation in the calcaneus, thereby helping to diagnose a calcaneal stress fracture. 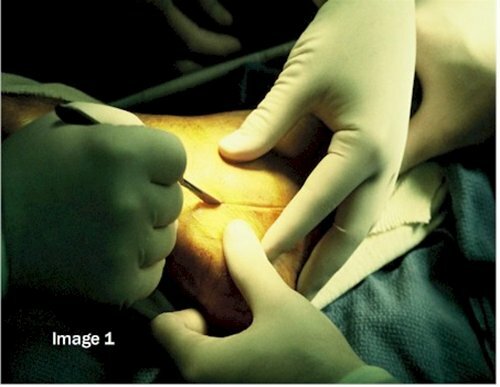 Bone scans are tests that utilize a radioactive nucleotide injected into the patient to identify areas of inflammation. A scan is taken of the injured area three times over the course of three hours. Each of the scans shows a different degree of inflammation based upon the increased blood flow to the inflamed area. In the case of a calcaneal fracture, a bone scan can help in two ways. First, the scan will locate the area of the fracture based upon the inflammation seen in fracture healing. 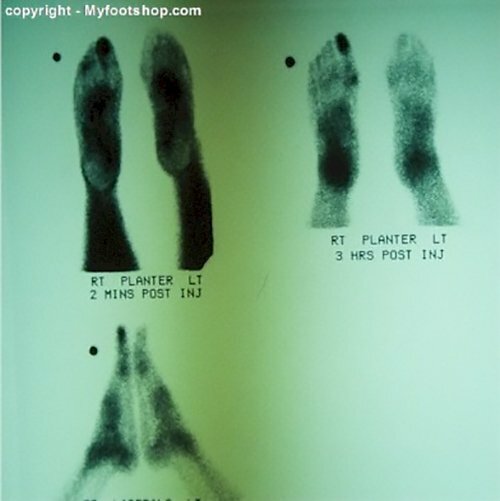 Second, the bone scan will help to differentiate between other potential problems of the heel such as plantar fasciitis. Lastly, a scan can help to determine the acuteness of the injury. For instance, we may see a questionable area on an x-ray but we will not be able to tell whether the suspected injury is old or new. The bone scan will help us in that a new injury will "light up" on the scan due to its current inflammation. An old injury, on the other hand, will not "light up" on the scan due to its lack of current inflammation. 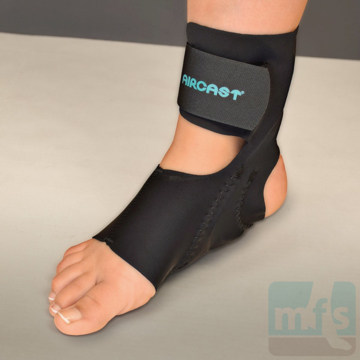 MRI's are also helpful in differentiating calcaneal fractures from plantar fasciitis. MRI's can identify small areas of bone edema suggestive of a fracture. Due to the cost of an MRI, insurance companies will often request a bone scan of the heel prior to approving a more costly MRI. A stress fracture of the calcaneus is a condition that is often overlooked as a differential diagnosis of heel pain. 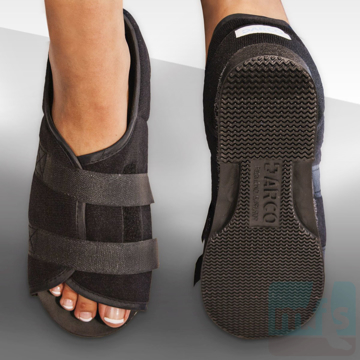 Plantar fasciitis (also called heel spur syndrome) is so common that most health care providers will defer to plantar fasciitis as a primary diagnosis when evaluating heel pain. 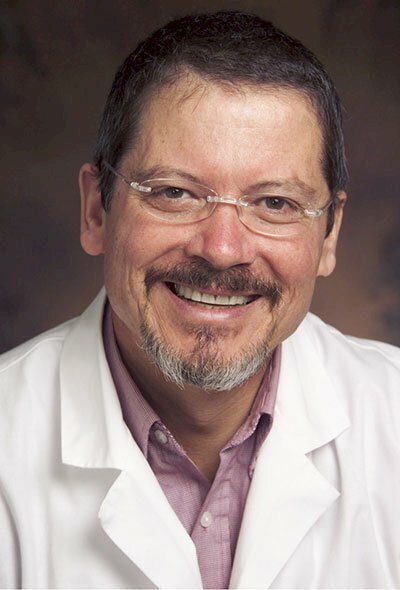 A good patient history, and particularly one that notes the onset and character of the pain, is very important when differentiating between plantar fasciitis and calcaneal stress fractures. Complex calcaneal fractures are difficult to treat and can be life-altering injuries. Three classifications are used to describe calcaneal fractures. The Essex-Lopresti classification describes subtalar joint depression fractures (very severe fractures) in a bit more detail than the more commonly used Rowe classification. A third and newer classification proposed by Sanders in 1993 uses CT scanning to determine the stage of calcaneal fracture. Plain x-rays and CT scans are often used to determine the extent and classification of calcaneal fractures. 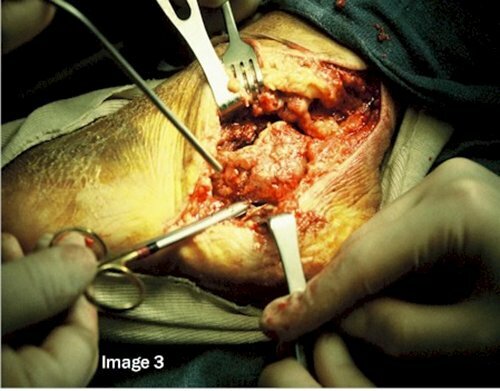 Complex calcaneal fractures occur as the result of a fall from a height greater than 14 feet. Calcaneal fractures are most commonly found in males age 30-50 y/o who are active in high-risk occupations. Calcaneal fractures are common among roofers and rock climbers. The second most common contributing cause to these traumatic fractures is automobile accidents. The differential diagnosis for a calcaneal stress fracture is found below. There is no differential diagnosis for complex calcaneal fracture. Non-displaced calcaneal fractures (Sanders Stage I) require a period of rest and partial-to-complete immobilization. Treatment options include hard casts or removable cam walkers. The duration of symptoms and time necessary for adequate healing varies with the age, nature of the fracture, and general health status of the fracture. It is not unusual to find calcaneal fractures that are symptomatic up to 4-6 months post-injury. As previously mentioned, displaced calcaneal fractures (Sanders Stage II-IV) can be very difficult to manage. The goal of treatment of complex calcaneal fractures is to restore the height of the calcaneus and to re-align joint surfaces. 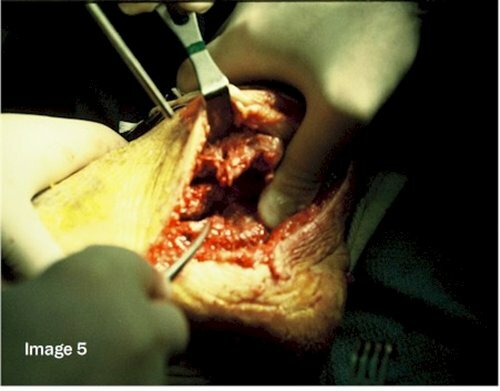 Closed reduction (manipulation of the fracture under anesthetic without surgery) can be successful in treating calcaneal fractures. 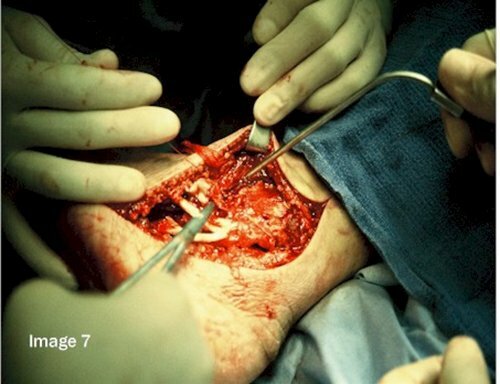 The success of closed reduction depends upon the stage of calcaneal fracture. 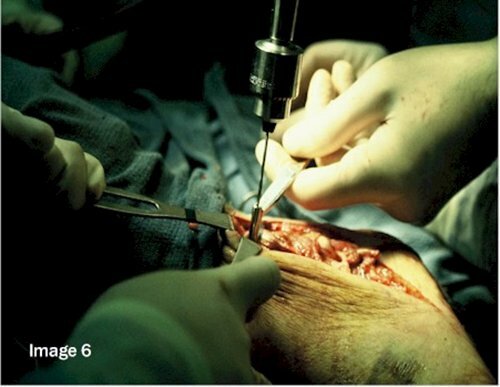 Open reduction, often called ORIF or open reduction with internal fixation, is what doctors use when closed reduction fails to reduce the fracture. Open reduction is not guaranteed to produce more successful outcomes compared to closed reduction. The decision when to perform ORIF for calcaneal fractures varies. Some doctors prefer to act as soon after the injury as possible, while others prefer to wait 1-2 weeks following the injury using a fracture pillow to allow for the initial phase of inflammation to subside. 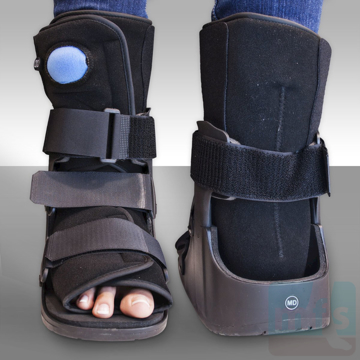 Follow-up care of the fracture post reduction (whether closed or open) varies but will include a period of non-weight bearing, splinting or casting to allow for fracture healing. In severe cases of joint depression fractures (Sanders Stage 3 and 4), additional surgery may be required to fuse the subtalar joint. 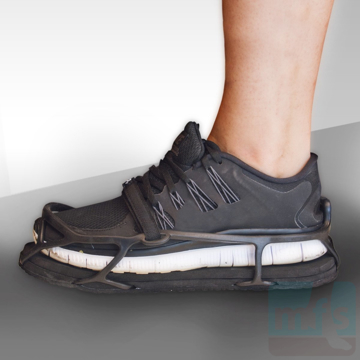 If the subtalar joint is significantly damaged in the injury, fusion of the subtalar joint is the only solution. 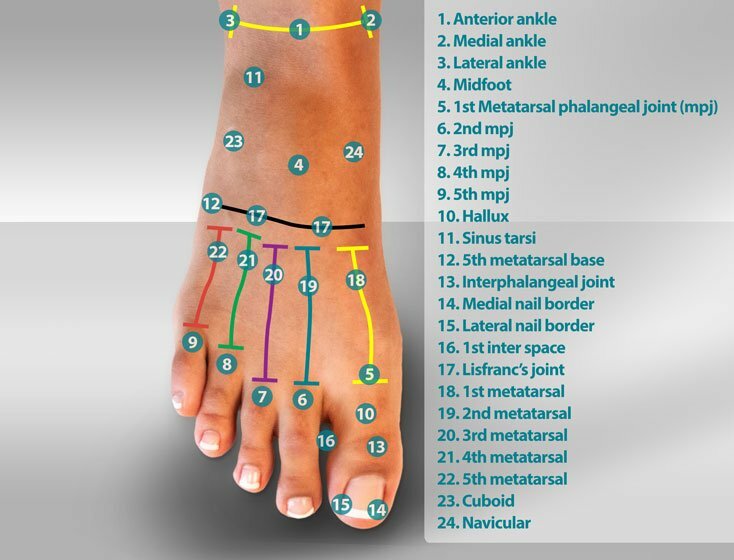 Most doctors will stage these procedures, performing a subtalar fusion long after the immediate trauma of the injury. In severe cases of subtalar joint disruption where degenerative arthritis is inevitable, subtalar joint fusion may be advocated during ORIF of the calcaneal fracture. The photos below show ORIF (open reduction with internal fixation) of a Sanders stage 4 fracture. Images 1 and 2 show the approach to the calcaneus, isolating the sural nerve in the lateral heel. Image 3 shows dissection of the subtalar joint. Image 4 shows the calcaneal cuboid joint. 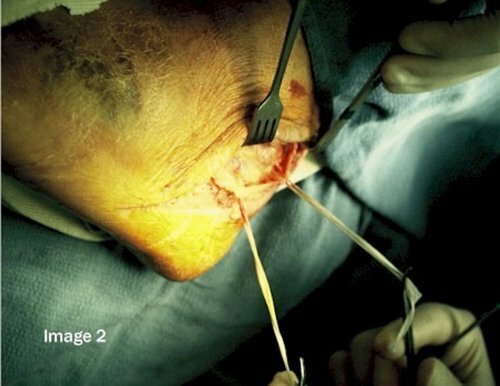 Images 5 and 6 show reduction of the fracture and partial fixation. 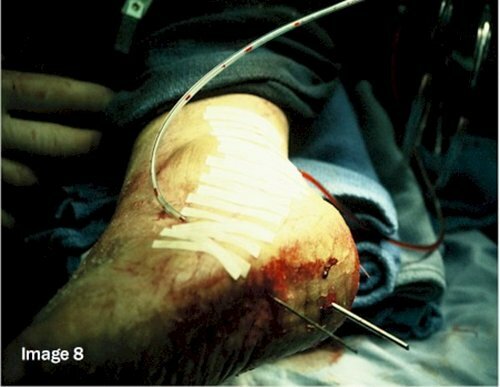 Images 7 and 8 show closure and drain placement prior to placement in a compression splint. Any injury of the heel that is suspected to be a stress fracture or complex calcaneal fracture should be evaluated by your doctor. In cases of severe fractures, delay in treatment can result in significant, lifelong disability. References for this article are pending. Most recent article update: December 8, 2018. Calcaneal Fractures by Myfootshop.com is licensed under a Creative Commons Attribution-NonCommercial 3.0 Unported License.